Here is your chance to be an Ally Ambassador! What is an Ally Ambassador you ask? Ally Ambassadors will be members of the official Ally Carter street team! They will complete missions to help spread the word about EMBASSY ROW, and have access to exclusive Embassy Row content AND great prizes! Sign up to be an Ambassador here (or here if you’re a UK resident!) and download official social media images here! The first 100 US and Canadian residents to sign up will receive a special advance copy of Embassy Row #1: All Fall Down, and EVERYONE who signs up will receive a bonus prequel scene Ally wrote that you won’t find in All Fall Down! So go and sign up and be an #ALLYAMBASSADOR!!! And as promised here is your super awesome super long excerpt…..United We Spy Chapter One !!!!!! P.S. Did you know you can follow Ally on Tumblr, Facebook, and Twitter ?!?! P.S.S. Don’t forget to send your fan art to [email protected] for Fan Art Fridays! I had a crazy week last week and didn’t get your questions to Ally until yesterday so…..I won’t have answers until later this week! But to make it up to you I am going to give you an excerpt from United We Spy! It was dark when the jet finally landed. I’m sure I must have slept on the long ride over the Atlantic, but I didn’t really remember. I just stared out the window: watching, thinking, waiting for something, but what, I didn’t know. On the tarmac, Agent Townsend whispered something to Abby, then squeezed her hand and kissed her softly when he didn’t think we were watching. But we’re Gallagher Girls. To tell you the truth, we are always watching. Abby let him go, her eyes a little misty. And I couldn’t help myself—I thought about Zach. He was out in the world somewhere. And a part of me worried that I might never see him again. I will have answers later this week so check back! P.S. I think it would be fun if you guys would send in pictures of your Ally books in fun & interesting places (the beach, farm, Eiffel Tower, etc.). I will do special postings of the pictures here and on Ally’s Tumblr page. Send pics to [email protected] !!!! I hope everyone is having a magnificent Martin Luther King day! I want to start off by introducing myself and letting you know that I will be taking over Molly Mondays. But I am renaming it Magnificent Mondays since my name is Shellie! I have a lot of fun things planned but I also want to hear from you and what you would like to see. 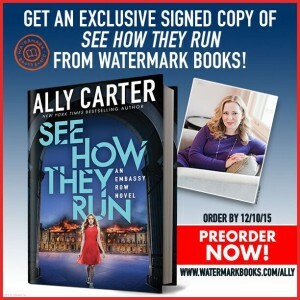 This site is for Ally Carter fans and we want you all to enjoy it and to visit it often. So please leave me comments and I promise I will read them and do my best to fulfill your requests. We are bringing back Fan Art Friday so please email your fantastic artwork to [email protected] so I can start filling up Ally’s Tumblr page with it! My something fun for my first Magnificent Monday and because Double-Crossed is in wide release tomorrow is a mini excerpt! She wasn’t a thief; of that much Hale was almost sure. But she wasn’t your typical society girl either. Her steps had too much purpose; her blue eyes moved around the room with too much precision. She reminded him far more of the girls in the world he’d chosen than the girls in the world he’d been born to, and that was why he knew that he shouldn’t let her study him too closely. That maybe she might see a little too much. I can’t wait to start hearing from all of you! I am going to start your week off with a mission! This one is very difficult, so be prepared! To solve this code you must first do a caesar cipher and shift the letters 7 to the right. Once you have done this there will be 6 different languages you will need to translate. They are grouped together in phrases so that they will translate correctly. The final word count (in English) will be 18. One word is a contraction. P.S. Keep sending in Fan Art! Who knows your art might make Fan Art Friday on Ally’s Tumblr!